According to the Robert Wood Johnson Foundation, a rapid improvement cycle is a "Quality improvement method that identifies, implements, and measures changes made to improve a process or a system.” In other words, it is an organized approach to making processes better in short order. You don’t use a rapid improvement cycle to shoot for the moon, but rather to make incremental changes that add up to major success. Each cycle builds on the work done during the last and suddenly that mountain doesn’t seem so hard to climb. Dr. W. Edwards Deming is widely thought of as the father of modern quality improvement. He was an American who is best known for his work in the Japanese auto manufacturing industry after WWII. His background in statistics and engineering led him to take a very scientific approach to process control and quality management. Deming broke a lot of ground in terms of operational improvement and modern business leaders owe him a lot. 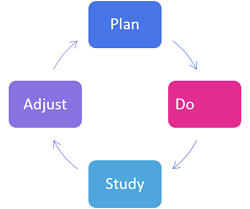 One of his most enduring techniques is known as the PDSA (Plan-Do-Study-Act) rapid improvement cycle. Although it is a rather simple approach, as far as improvement methodologies go, when used effectively it acts as an engine for improvement within an organization. Much like any scientific experiment, the cycle begins with a plan. The plan outlines the problem, current state, success criteria, team members, and timeline. It is important to truly engage in the planning process and not jump too quickly to solutions. Although the Plan stage is ¼ of the steps in the cycle, some practitioners expect it to take as much as half the time. Once the plan is complete, the target changes can be implemented. It is very important to closely observe the impacts of the changes and not assume that all activity is progress. The Study phase is critical to a rapid improvement cycle. During this phase, the results of the new process are compared against the old process and the desired results. Results can take the form of any measurable objective such as cost, quality, customer satisfaction, or speed. If the Study achieves the desired results, the Adjust phase begins with making the change part of the new Standard Work. The proper documents are updated, team members are trained, and new expectations are introduced. In due time, the cycle can be repeated against the new process and progress toward 100% customer value and zero waste can continue. Rapid-cycle improvement is an important tool for leaders because it provides teams a structure for continuous improvement. It helps teams overcome resistance to workflow and processes changes by making it a part of everyone’s day-to-day job. You can get even more out of the approach by deploying software that makes it easy to track projects, record results, and communicate success with the organization. Deming’s idea is wildly popular for one simple reason. It works. KaiNexus empowers leading organizations in every industry to start, spread and sustain their improvement cultures. Wherever you are in your improvement journey, KaiNexus will help you take it to the next level with unprecedented visibility, communication, and standardization.